Patrul Namkha Jikmé (Tib. དཔལ་སྤྲུལ་ནམ་མཁའ་འཇིགས་མེད་, Wyl. dpal sprul nam mkha' 'jigs med) aka Padma Khalong Yangpa Tsal and Tulku Namkha Jikmé (1888-1960) of Dzachukha was a son of Dudjom Lingpa and of Akyabza Kalzang Drönma , and a reincarnation of Patrul Rinpoche. 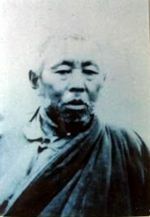 Patrul Namkha Jikmé was the seventh son of Dudjom Lingpa. His direct brothers are Tulku Lhatop and Tulku Dorje Dradül. Patrul Namkha Jikmé was recognised by Dza Tsamtrul Rinpoche Kunzang Dechen Dorje (Pema Kunzang) and Dudjom Lingpa as an incarnation of Patrul Rinpoche, and enthroned at Dzagyal Monastery, in Dzachukha, where his previous incarnation had formerly resided, and where he went to live. It’s not the time to enthrone him. The Mamos and the Dakinis will postpone the event until then. Do just as the envoys request. Since it is of great significance, don’t refuse them. He will be capable of working for the welfare of beings. [In 1895, when I was 60], our tent encampment moved to Dzagyal Monastery. I was greeted there by a procession of monks playing musical instruments and then [my son] Patrul Namkha Jikmé was granted investiture on the throne. I gave teachings from the middle winter month until the middle spring month. At the latter part of the middle spring month, we moved our tent encampment once again, to a valley called Tri-barma. Patrul Namkha Jikmé’s two main teachers were his father Dudjom Lingpa, and Khenpo Kunpal. He revealed nine volumes of terma, and constructed a shedra at Dza Pukhung Gön and a Zabchö Shitro Gongpa Rangdrol drupdra at Dzagyal Monastery. His main dharma heir was his own daughter, Khandroma Kunzang Wangmo, a great-daughter of Dudjom Lingpa. ↑ Akyabza Kalzang Drönma was the third consort of Dudjom Lingpa, and also the mother of Tulku Lhatop and of Tulku Dorje Dradül. ↑ Dudjom Lingpa, ‘A Clear Mirror’, The Visionary Autobiography of a Tibetan Master’, The Outer Autobiography, translated by Chönyi Drolma, Rangjung Yeshe Publications, 2011, page 169-170. ↑ Dudjom Lingpa, ‘A Clear Mirror’, The Visionary Autobiography of a Tibetan Master’, The Outer Autobiography, translated by Chönyi Drolma, Rangjung Yeshe Publications, 2011, page 174. ↑ Dudjom Lingpa, ‘A Clear Mirror’, The Visionary Autobiography of a Tibetan Master’, The Outer Autobiography, translated by Chönyi Drolma, Rangjung Yeshe Publications, 2011; p.189. This page was last edited on 11 April 2018, at 19:44.